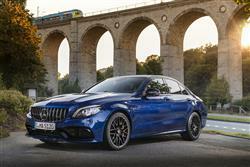 The Mercedes-AMG C 63 gets smarter looks, a new 9-speed auto gearbox, even sharper handling and a smarter cabin. But its key selling point hasn't changed: a throaty 4.0-litre V8 that still wields a big stick. Select from 476hp C 63 or 510hp C 63 S states of tune, with in each case a choice of saloon, estate, coupe or cabriolet body styles - and enjoy responsibly. So - what have we here? A Mercedes C-Class? To some extent, yes. But a very angry one. We're talking twin-turbo V8, tyre-smoking excess and a top speed of potentially up to 180mph. This is the car that sits at the heart of the Mercedes-AMG tuning division's model line-up, an improved version of the fearsomely fast second generation C 63. For driving enthusiasts, a car like this often lies at the end of a long progression of power. Perhaps for you, it started with something like a fast Fiesta. Then, as times got better, you graduated into something a bit nicer - say a Golf GTI - and from there, onwards to even greater hot hatch sophistication - maybe an Audi RS3. Whatever the cars in question, all may have bought you to this point, the pinnacle of the practical performance car tree. A time in your life when somehow, it all seems quite sensible to be driving something not much larger than a Focus that has a 4.0-litre biturbo V8 with up to and around 500hp shoe-horned in up-front. Something like this C 63. This MK2 model, first launched in 2015, still bears that badge, even though the old normally aspirated 6.2-litre V8 its predecessor had has been substantially down-sized, with those twin turbos added as customer compensation. This car's most unique selling point hasn't been lost though, specifically the cachet of sharing its engine with a proper supercar. With the first generation C 63, the V8 in question was lifted from the exotic SLS: here, the potent powerplant is borrowed from the almost equally desirable Mercedes-AMG GT. We're now well familiar with the Mercedes 4.0-litre V8 twin turbo engine. So familiar in fact that it seems a long time ago that so much fuss was made when it replaced the thirsty old 6.2-litre unit. What we didn't get when the 4.0-litre powerplant was first installed into the C 63 was an approopriately modern auto gearbox to go with it, early versions of this second generation model equipped with a 7-speed auto from the original 2015 launch. So Mercedes has now put that right, mating this V8 with a 9-speed AMG SPEEDSHIFT MCT 9G transmission that according to the brand, delivers an even more agile gearshift response. 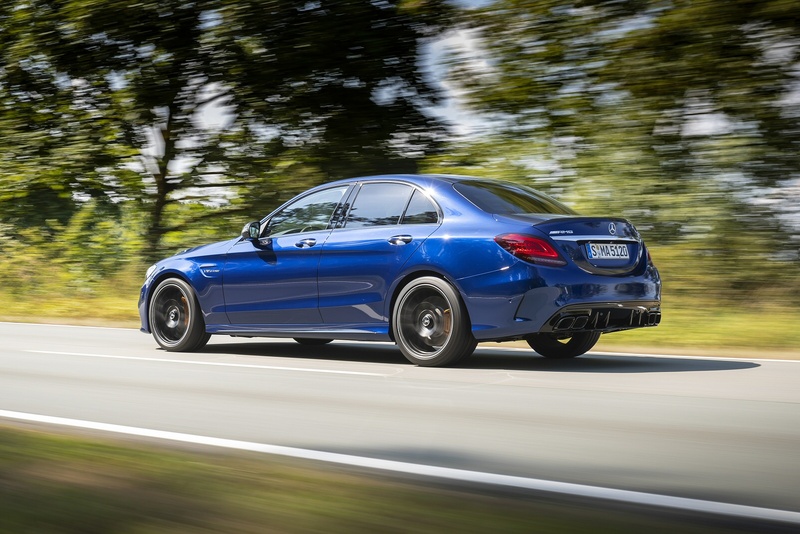 As before, the engine comes in two states of tune, the standard C 63 offering 476hp and 650Nm of torque and the uprated C 63 S delivering 510hp and 700Nm of pulling power. As ever in any C 63 variant, the performance is startling, the rest to 62mph sprint demolished in just 4.1s in the C 63 (or 4.0s dead in the C 63 S). 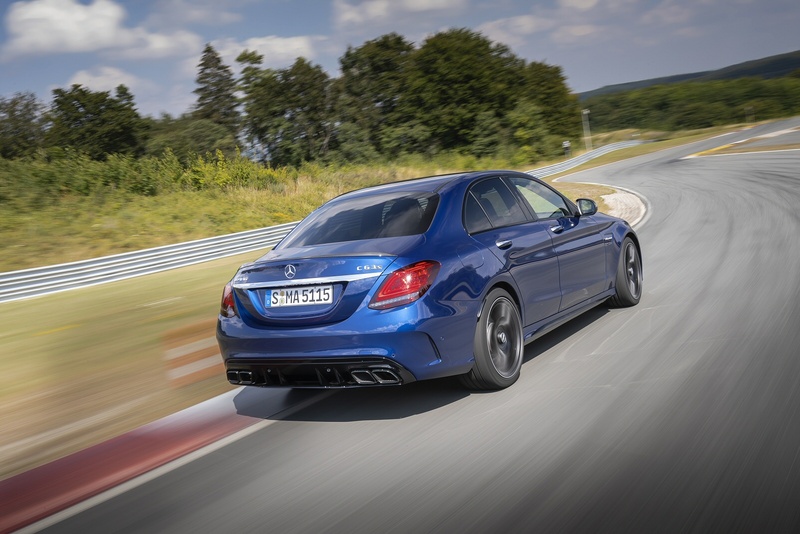 The top speed is limited to 155mph in the C 63 - or 180mph in the C 63 S. As before, buyers aren't offered the 4MATIC 4WD sytem you get in the lesser V6 C 43 model, so it's rear wheel drive only; which can lead to a few tense moments when cornering in the wet. 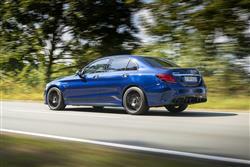 As always, the typical V8 engine sound remains a key element of the AMG driving experience. 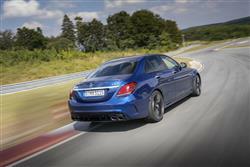 The C 63 comes as standard with an AMG exhaust system with a variable flap. The more powerful C 63 S comes with dynamic engine mounts. These resolve the conflicting aims of comfort and dynamic performance by reducing vibrations in the engine/transmission unit. The C 63 saloon, estate, coupe and cabriolet models have always majored on understated muscularity and in their latest guises, things are no different. Subtle aesthetic changes underscore this revised MK2 model C 63's visual identity. The AMG-specific radiator trim sports vertical louvres in high-gloss chrome and a re-styled front apron features a sleeker 'A-wing' design. In profile, there are sporty side skirts plus aerodynamically optimised AMG light-alloy wheels, while at the rear, the twin tailpipes sit in a more expressive diffuser. Inside, the main change is the addition of a fully digital 12.3-inch instrument cluster in front of the driver which brings the vehicle functions directly to life with the three AMG-specific display styles - 'Classic', 'Sport' or 'Supersport'. The buttons for the AMG Ride Control, the optional active AMG performance exhaust system and the three-stage gearbox modes are grouped around the standard Touchpad controller, above which is an AMG badge and surprisingly non-tacky IWC-branded analogue clock. Most owners will want to specify the optional AMG Performance seats, which provide optimum lateral support when adopting a dynamic driving style thanks to the special design of the seat side bolsters of the seat cushion and backrest. As an option, the seat side bolsters can be perfectly adjusted to the body contours by means of built-in air cushions. Prices start at around £66,500 for the C 63 saloon, with the estate version offered at a premium of £1,200 over its four-door stablemate. The Coupe version costs around £2,300 more than the saloon. Work around a £73,000 budget if you want the cabriolet. Whatever your body style choice, there's a premium of nearly £9,000 to pay if you want one of the C 63 S models. You probably don't need us to break the news that this is quite serious money but it's about the same amount as you'd pay for a rival Audi RS4 Avant - or a BMW M3 saloon with the 'Competition Package' fitted. You're also getting more power with the C 63 too remember and you certainly get a beautifully finished vehicle with plenty of equipment on board. The C 63 features Nappa leather for the seats and the steering wheel, the COMAND infotainment system and a memory package for the seats, plus 18-inch multi spoke wheels. The S version isn't just about more horses and a trick diff either. Customers who sign up to the senior C also get 19-inch alloys and a 'Race' function in the COMAND set-up to allow the driver to alter the gearbox, engine and damping modes according to their preference. A set of AMG Performance Seats are teamed with grey belts. Should you want to go further, you could also specify a powerful Burmester surround sound system or, for those wanting a soundtrack straight from Affalterbach, the option of a variable AMG exhaust. There's also the incredible LED Intelligent Light System to consider. The optional AMG Aerodynamics package for the C 63 Coupe provides an even sportier look: the more expressive front splitter, spoiler lip with integral Gurney flap, broader side skirt inserts, flics in the rear bumper and more expressive diffuser insert are finished in high-gloss black. This isn't the point where we tell you how reasonable a 500hp Mercedes is to run. Should you exercise your right boot liberally, running costs will still rank as ruinous to 99% of UK wage earners, but exercise a little more restraint and the efficiency gains of this 4.0-litre engine can be brought to bear. Mercedes-AMG quote a combined fuel economy figure of 34.5mpg for the saloon and 33.6mpg for the estate, regardless of whether you choose the standard power output or the uprated S model. These economy figures equate to 227g/km of carbon dioxide emissions for saloon and 228g/km for the estate. Those numbers really aren't that bad. Well, they aren't bad in comparison to other 500hp vehicles. If you're old enough to remember the days when a car that could get better than 30mpg was deemed economical, they're quite remarkable. Residual values ought to hold up well on the back of them and the fact that this is no facelift of an ageing model. Insurance is likely to require a bit of specialist help from a diligent broker. If you�re looking for a new Mercedes-AMG C-Class C63 S 5dr 9G-Tronic Petrol Estate for sale, you�ve come to the right place. At Bristol Street Motors we don�t just have the best Mercedes-AMG C-Class C63 S 5dr 9G-Tronic Petrol Estate deals, we also offer friendly advice and help with all your enquiries to ensure your buying experience is a happy experience.